« Heed the Prophet Stallman, oh Software Sinners! 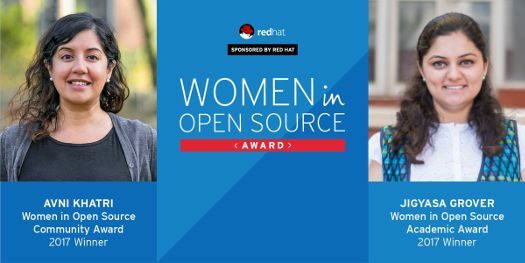 Last week, Red Hat’s DeLisa Alexander presented the third annual Women in Open Source Award to Avni Khatri and Jigyasa Grover at Red Hat Summit 2017. Red Hat is a company that does many things right, including promoting women in tech. Learn about the two winners of this year’s Women in Open Source Award, announced at the Red Hat Summit conference in Boston last week. In this video, when Avni Khatri describes the open source computer lab she is helping to set up near Oaxaca City, Mexico, I could visualize the students there. I could sense their excitement and hope. Kudos to Avni and all the others who helped make that happen. And Jigyasa Grover, a college student winner of this award, has so much potential to do good in this world. I bet her family, friends and college are immensely proud of her — as they should be. Follow Avni Khatri and Jigyasa Grover on Twitter to stay in the loop on what these pioneers will be doing next. Share their stories with people you know, too. The most powerful force in the universe is storytelling. Guess what? You’re a storyteller.